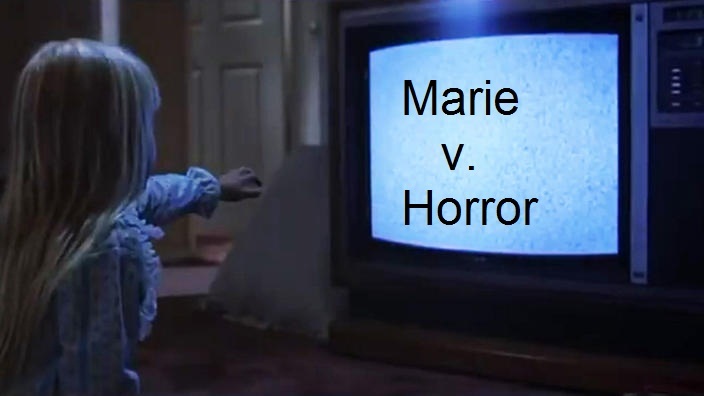 Marie begins an on-going series about Horror Films. Be afraid… very afraid. A funny thing happened to me at the weekend; I watched a film I had said I would never, ever watch. I have been actively avoiding it all of my film-watching life. And yet I sat down and chose to watch. More Later. First, some things you need to know. As a rule, I don’t do horror. My glib response when asked why not has generally been something about there being enough things to frighten me in real life without actually paying for the privilege of being scared stupid. I don’t want to be frightened, and I don’t understand why anyone would actively seek to put themselves in that position, either in real life or in a cinema. I’m led to believe that the thrill of being scared senseless is something which people enjoy, and all fine if that’s you, but I’d prefer not if that’s OK thank you very much. The thing is though, it all depends on how you define horror. For instance, from a young age, I’ve had no problem watching vampire movies. But then, everybody knows that vampire movies aren’t really about vampires. I can watch the black and white classics and Guillermo del Toro (through my fingers sometimes, but OK). Old-fashioned horror films have a subtext, and del Toro tells fairy stories as parables. I’m sensing a theme here. But I get freaked out by eyes going weird, people speaking in strange voices, jump scares, gore, insects, madmen who kill people for no apparent reason, zombies, eyes going weird. Did I mention eyes? I had nightmares for weeks after watching Michael Jackson’s Thriller video, and I still have to look away at the very end of it 35 years later. I hope you’re beginning to get the picture. Randomly violent, gory or frightening films whose sole purpose is to shock, terrorize or scare just have no place in my viewing list. The problem is that I am also a film lover, and I am only too aware that my aversion to horror films means that I’m missing out on discovering some of those on the ‘all-time’ lists – are they truly as good in a film-making sense as they are proclaimed? The best horror films are not those that are pointlessly violent, but the ones that are actually about something else. And every now and again a film gets talked about so much that, even though it falls within the ‘horror’ genre, it is also classed as A Very Good Film in a wider sense. Although to be fair, there aren’t too many horror films in Sight & Sound’s Greatest Films of All Time list. Which brings me back to where I started. A real cinephile would make an effort. And so occasionally, I do. Carefully. Which is how come I found myself watching The Exorcist one Saturday afternoon ………. Stay tuned for the next installment.